An easy guide for drying herbs in the oven. 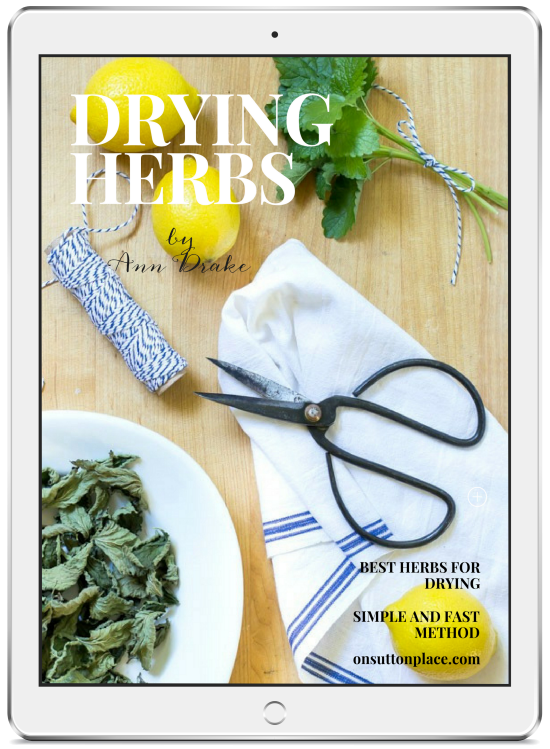 Dried herbs are perfect for making tea, seasoning your favorite dish, or gift giving. Gardening goals can be challenging. We need all the stars to align and give us sunshine followed by rain. I’ve had many gardening goals that were never achieved…but that’s life. The main goal for my herb garden this year was to grow the plants big enough to harvest the leaves for making tea. 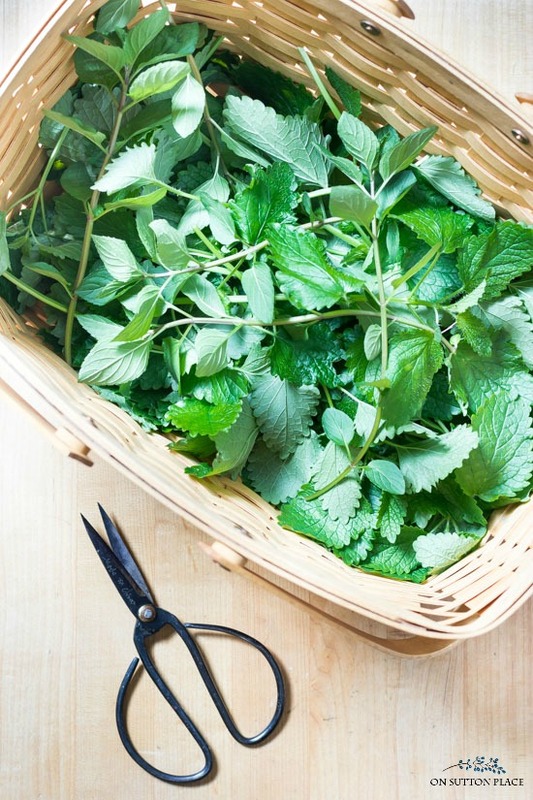 I have been drying lemon balm and mint about once a week, but it’s going to take most of the summer to fill even a few jars. I’m learning a lot though and every time I dry a batch of herbs, I feel very accomplished! Here is a basic list of herbs that can be dried. 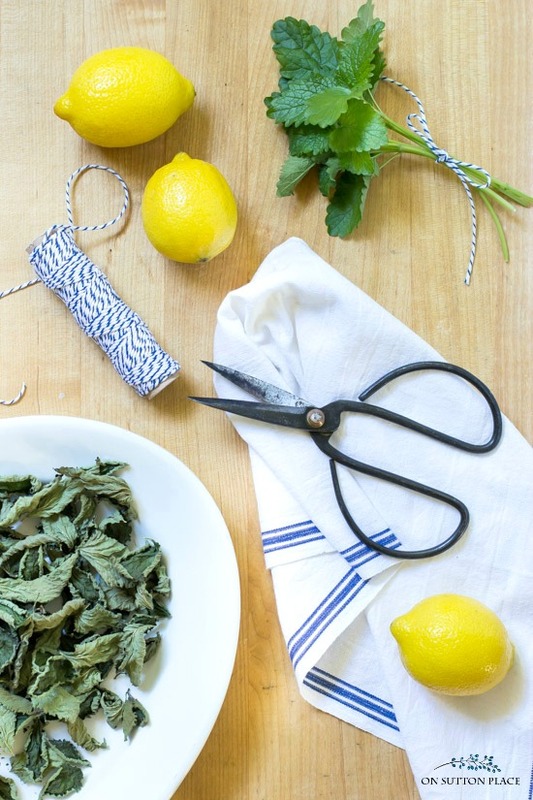 For tea, I’m drying lemon balm (shown in this post) and mint. For cooking, I’m going to dry basil and rosemary. I also freeze basil to use in spaghetti sauce and soups. The herb drying process explained below can be used for all the herbs listed. 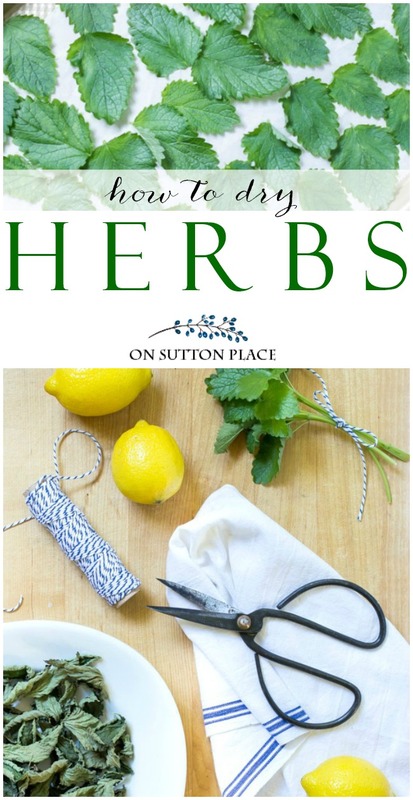 Harvest your herbs. If the plants are homegrown and free of pesticides, it’s not necessary to wash them. Washing can strip the oils from the leaves. If you are drying grocery store herbs, it is best to gently rinse them and dry completely. Don’t harvest more than 1/3 to 1/2 of your plant at a time. 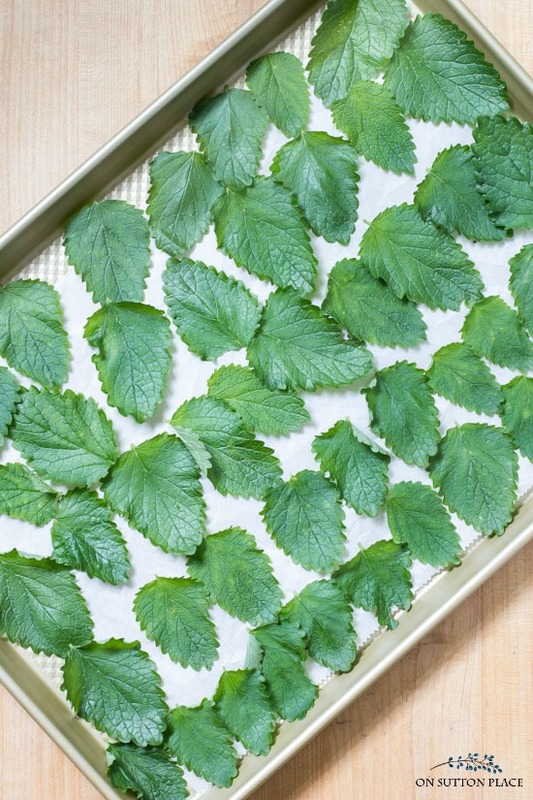 Pinch off the leaves from the stems and lay them out on a cookie sheet. Try to keep them in one layer. Turn your oven on to the lowest setting. My oven won’t go lower than 170 degrees F so that’s what I use. Dry the herbs in your oven for about an hour, making sure to leave the door ajar. Closing the door will actually bake the herbs, which is not what you want. The herbs will look shriveled and they will darken in color. I’m storing my dried herbs in quart mason jars and they are taking a long time to fill. I hope to get a couple of jars of both mint and lemon balm by the end of the summer. Since I’m drying for tea, I am gently crushing the dried herbs before I put them in the jars. I’ll be back soon with some printable tags in case you want to dry some herbs for yourself! PIN THIS TO YOUR GARDEN BOARD! Get a printable copy of this tutorial by joining the OSP email subscriber list. After joining, you will gain instant access to the Members Only Library that contains this 2-page PDF plus DIY wall art, eBooks, recipe collections, gift tags, and more! If you are already a subscriber, this PDF is waiting for you in the library. My herb garden has never looked better, the weather this year has been perfect for them. I have harvested many batches of each already. I do wash them however, because of the major amount of pollen blowing around this year. I have also been enjoying the herbal/fruit waters with the fresh herbs as well. Nothing beats strawberry/basil water on a hot day. Thanks for sharing. Hi Ann – Thanks for this great info. I noticed that dill is not on the list. Would you dry it the same way? Going to do this with my herbs this year. Have a great day! PS – I also read you post again this year on Basil. Thanks for linking it. Yes. Dill will dry the same way. Since the stems are so delicate it may not take as long in the oven so watch it carefully. I will add it to the list! I have tons of lemon balm growing around my property! Thanks for the tutorial. I will certainly use it! Pinning this! Thank you, Ann, for this great post. I have an herb garden that is thriving and I’d love to try drying some of the herbs I have. I always find something useful in your posts. I subscribe to other decorating/design blogs but yours is undoubtedly my favorite! I have been drying and saving herbs for as long as I can remember. Like you, sometimes it takes a while to gather as much as you need! There are times when the herbs are taking over and I will cut bundles, band the stems and hang them upside down in my kitchen window using a tension curtain rod for the hanger. I think the mason jar idea is great. One thing I do all the time is wash. I keep one deep plastic tub for this purpose only. I put 1 teaspoon of salt in the cool water, swish to dissolve the salt and soak the leaves for a few minutes, usually 5 or 10. My reasoning is this. Little critters hitch a ride sometimes. I use no chemicals on my plants and that makes them happy little places for tiny fleas or spiders. The quick salt soak and brief rinse takes care of that. I have not noticed a change in flavoring. So far anyway. I also gather enough to fill the little storage jars I pick up at IKEA. I make gift baskets for friends and family every Thanksgiving. Each one has a little collection of herbs as well as gifts specific for that person. It is my way of saying thank you to each of these special people. Each item in the basket has a purpose and each herb is labeled so that over time a collection has been gifted. I love the gift idea, I have such an abundance this year. I think I will begin a separate basket as well. I just purchased a dehydrator brand new at a yard sale for $8, so I am going to try that as well. Thank you for the tip about the salt bath and your gift giving ideas. What a lovely way to use your herbs! This was a timely subject. I planted several basil plants this year that are out of control and, at the same time, last year’s basil double crossed me and came back when I thought it was dead. I like fresh basil but even I have my limits. Thanks. Oh, I wish I had too much basil. That is the one that no matter what I do, never does as well as I would like. I love Strawberry/Basil water and now is the season for both. I was going to research how to harvest and prepare herbs for storage when I saw this in my inbox. Thanks for the timely advice!